Posted 3/31/2018 7:02pm by Betsy Austin. So far it looks like we may have radishes, turnips, lots of green leafies..swiss chard, kale, mustards, orach, bok choi and other asioan greens, chives, pineapple sage for the first week. Some other things we may have soon would be salad greens, beta greens, lettuces, endive and escarole..these are growing just a bit slower and may or may not be ready the first week. It may be a couple more weeks on the rhubarb. Wow!! Tomorrow is the 1st of April!! Not sure what happened to February and March!! How time flies when you're having fun!! Weather has been mostly dry..a few near showers, but they didn't amount to much.mostly just a lot of cold wintry wind with some random snow flakes and rain drops!! Last week was a lot cooler..highs in the 40's and 50's..lows way down in the 20's. This week has mostly been warmer..at least when the sun is out..if it hides behind a cloud the breeze is just downright cold!! Today though we got up to 70..the sun was downright hot!! We are still way dry..our mountains have gotten a bit of snow, but snow pack is still way down. We have our request in for a nice gentle overnight rain..preferably on Sunday nights..although we will take rain when we can get it at this point!! We have had another busy couple of weeks..tree pruning is done for now so we can move on to other projects. Last week was pretty chilly of a morning so we got some quality time in the prop house and the high tunnel. Alex planted the last succession of greens and lettuces in the high tunnel..she gives me that look and tells me there is NO more room in the inn!!! It is stuffed..and growing rapidly! !In the prop house we got more little guys pricked up..lettuces, the rest of the celery, lavender, rosemary, basil, and a few other herbs. We also seeded trays of kale, portuguese kale,late kohlrabi, late cabbages. another succession of lettuces, asian green and scallions..these are all for outdoors. This next week we need to get the alliums kicked out to the hardening off bench..just waiting for the night time temps to get up closer to 32 degrees!! Then we will have room to kick lettuces, artichokes, and celery out to the honey house..so we can prick up tomatoes, peppers, eggplant, celeriac. broccoli and cauliflower..so we can start more seeds!! Alex and the work share folks worked on getting the cover crop in. more cottonwoods dug, and prepping a few beds for early spring outdoor goodies. Terry has a couple of projects she has been working on in between helping the rest of out. Fun happenings here on the farm..apricots are in full bloom..hope the don't get frozen during the next little cold spell mid week!! Birds are all thinking spring thoughts..heard our first woodpecker this morning. Food for thought.. Question of the month..sooo..what can each of you do to help conserve water?? Work days for March..every Saturday..9 am to noon..projects for March include tree pruning, weeding and mulching rhubarb, getting beds ready for alliums. 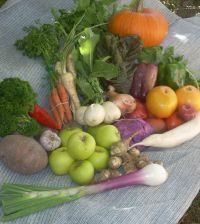 cabbages, and kohlrabi..give me a call 970-249-9725 to set up a day and time!! Hope you are all ready to enjoy spring! !